while promoting our region as a heritage tourism destination. The Baytown Historical Preservation Association ("BHPA") is a 501(c)(3) nonprofit organization dedicated to the preservation of structures, artifacts, and documents that reflect and represent the history and culture of Baytown and its people through educational programs and materials that communicate our heritage. It is our historic heritage that helps to make Baytown (Lynchburg to Cedar Bayou in particular) a unique place and BHPA strives to keep that history alive. The historic 1894 one-room Wooster School and 1910 Brown-McKay House located at the Republic of Texas Plaza, 5117 North Main Street in Baytown, are preserved and interpreted by BHPA. Visitors experience rural life in a rice farming community that existed before the discovery of oil and the subsequent industrialization of the area. BHPA is enhancing this experience by the addition of a post and beam barn that serves as an interpretative venue as well as a meeting facility. BHPA is also fervently restoring the 1898 Bert Brown and 1910 John Celestine Sjolander homes. 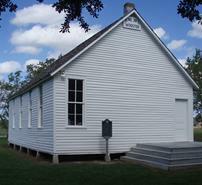 BHPA is a living history museum located in a city park so many people assume that we are funded by the City of Baytown. While BHPA has received financial support for special projects and park support (ground maintenance and in-kind donations) from the City, we are approximately 95 percent privately funded. We are independent of other groups so we do not have the security of large donations from individuals and corporations supporting our budget each year. Instead, we depend on different levels of support from our members and people like you. BHPA is small in comparison to other great museum and culture groups in the Baytown area, and a donation of any amount to BHPA can actually make a difference in helping us preserve our treasured historical structures that represent our community's culture history. Please browse our website to learn more about BHPA and its activities, projects, and special events. If you are a member of BHPA, we thank you for your support. If you are not a member, we invite you to join us! Support the Baytown Historical Preservation Association when you search the Web or shop online with Goodsearch, a patent-protected Yahoo!-powered search engine.